Christian Symbolism on Roman Coins. Table 7: Coins struck after 364 (that is, after the early period which is the subject of this site on early Christian symbols). 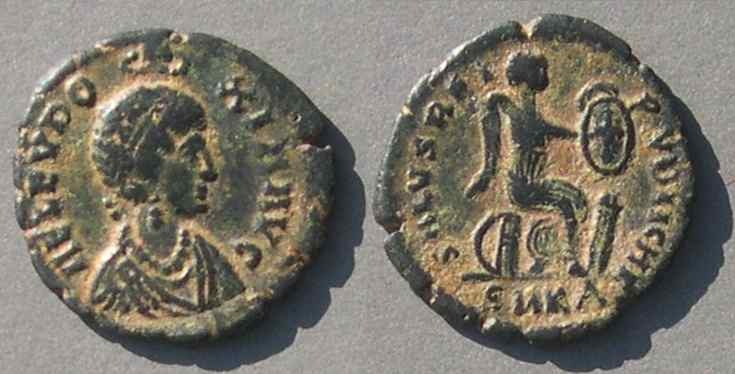 Christianity was well-established by the reign of Valentinian, 364-375, and from then on it is common to find Christian symbols on Roman coins. Unlike the previous pages, this page does not attempt to be comprehensive, rather it just illustrates some interesting examples. 1) GLORIA ROMANORVM, emperor right, head left, dragging captive and holding in left standard with chi-rho. 2) SECVRITAS REIPVBLICAE, Victory left holding wreath and palm. Type 1, the GLORIA ROMANORVM type, always has a chi-rho on a standard. 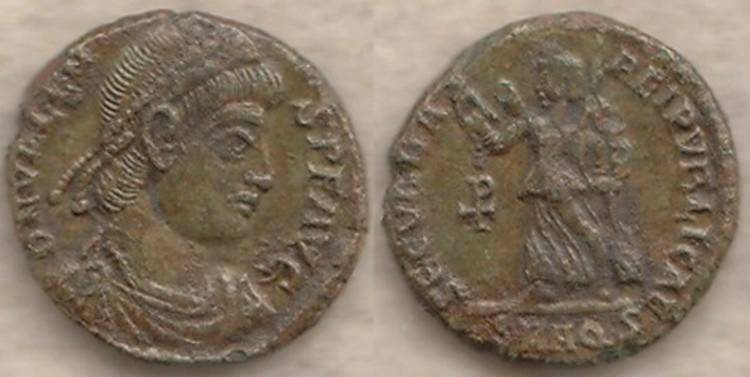 This type is issued for Valentian, Valens, Gratian, Valentinian II, Theodosius, and Arcadius and is one of the most common Roman coins types of all. Type 2, the SECVRITAS REIPVBLICAE type, features Victory without a Christian symbol, but sometimes has a Christian symbol as a control mark in the field. 17 mm. 2.73 grams. 6:00. Cross-rho in left field. Rare thus. This extremely common type was issued for Valentinian, Valens, Gratian, and Valentinian II. The "Hand of God," first seen on a deified Constantine type (Type 2.5), appears on the obverse under Arcadius and his wife Eudoxia. His first issue, Jan. 19, 383 to August 25. 383. 21 mm. 6.24 grams. 5:30. Cross in field left, T (a type of cross?) in field right. Eudoxia. Married Arcadius in 395. Virtual eastern ruler 400-404 AD. Victory inscribing a shield with a chi-rho. RIC X 104, struck 401-404. Another Eudoxia with the "hand of God." This one has Victory inscribing a cross (instead of a chi-rho) on the shield. 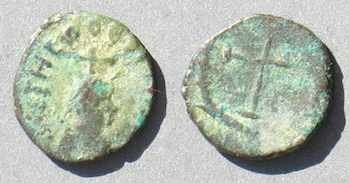 RIC X 104 variety (with cross), struck 401-404. Still another Eudoxia with the Hand of God. 17 mm. 2.28 grams. 11:30. RIC X 84, struck 401-403. In the fifth century it is common to have a cross as the reverse type on small AE4 coins. 11 mm. 0.82 grams. 6:30. Cross in wreath, a very common type. However, note the unusal cross above the head on this example. at Constantinople, Nicomedia, and Antioch only. Cross above head/monogram reverse, Nicomedia mint. RIC X 551variety. 551 does not mention the cross above the head. 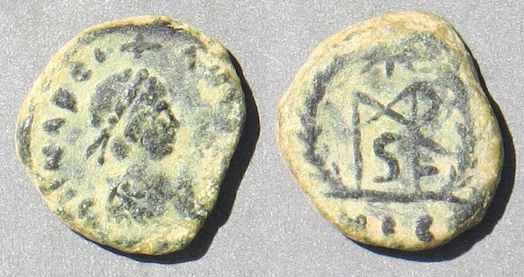 Crosses on coins after 364 AD are too common to document; this page illustrates only a few. 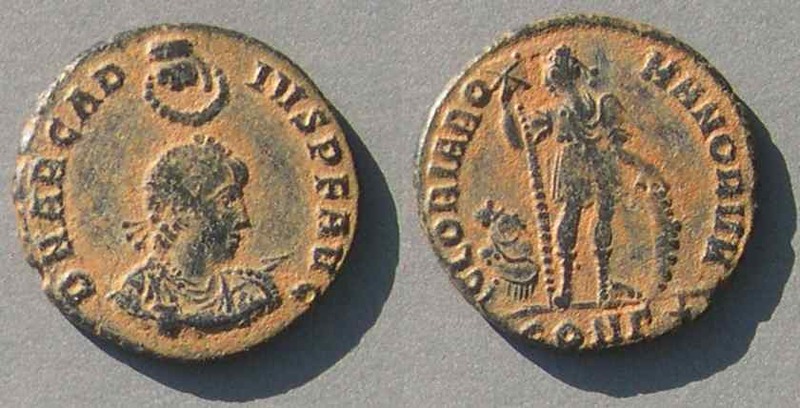 Return to the main page on Christian Symbols on Roman Coins. Leave the Christian-Symbols pages and go to the Table of Contents for this whole educational site.